The upper material is a nylon transparent stretch tulle, on skirt with sewn sequins, making sparkling effect, the bodice is hand embroidered by miniature yellow and pale blue beads and sequins. This material has nice light yellow color and sequins make nice iridescent effects with yellow pearly tint. There is whole pastel yellow lining which correspond well with upper transparent material and makes nice airy effect. All inner seams are hidden or flat. Enjoy nice contact and look during wearing of the dress. This is product of high-quality work out and the artistic value. 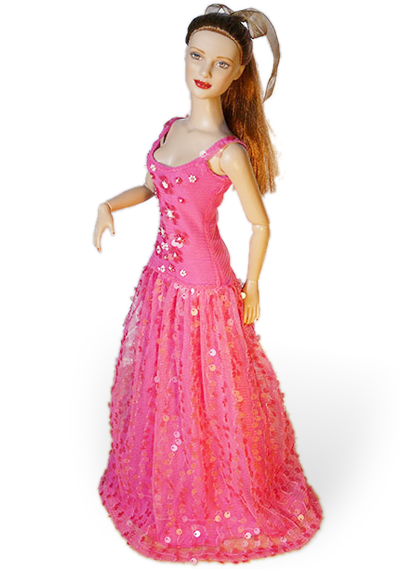 The line of dress is exactly fit for 16inch fashion doll Sybarite GenX, Tonner Tyler Wentworth, Fashion Royalty (FR16) and Urban Vita. It is also suitable, but very loose on breast, for other 16inch dolls as Poppy Parker, Tulabelle (Integrity Toys); Antoinette, Cami (Tonner).